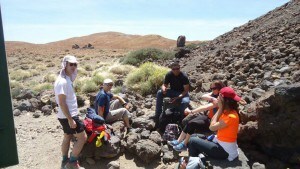 Teide (3718 m) is the highest point of Spain, although it is not on the mainland but on Tenerife, Canary islands. 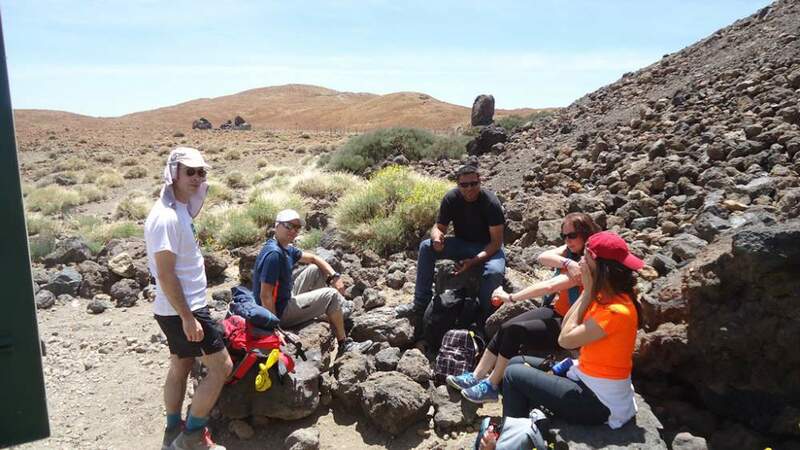 This post is about our tour: 6 enthusiastic physicists on Teide. This was a hard tour. 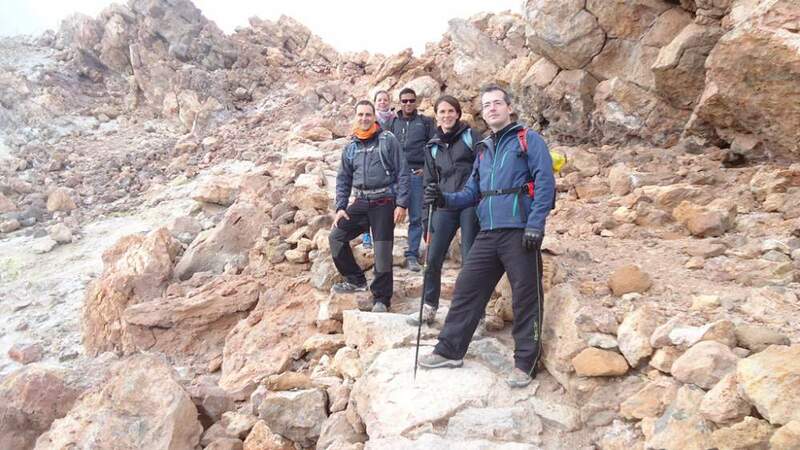 Five of us from the Institute for Astrophysics (Instituto de Astrofísica de Canarias), Angel, Elena, Pedro, Cloe, and me, plus Roderick from Meudon Observatory in Paris, climbed Teide from the car parking at Montaña Blanca, which is at 2350 above the sea level. 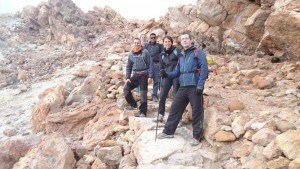 6 physicists on the summit of Teide, from left: Pedro, Angel, me, Roderick, Elena, and Chloe. 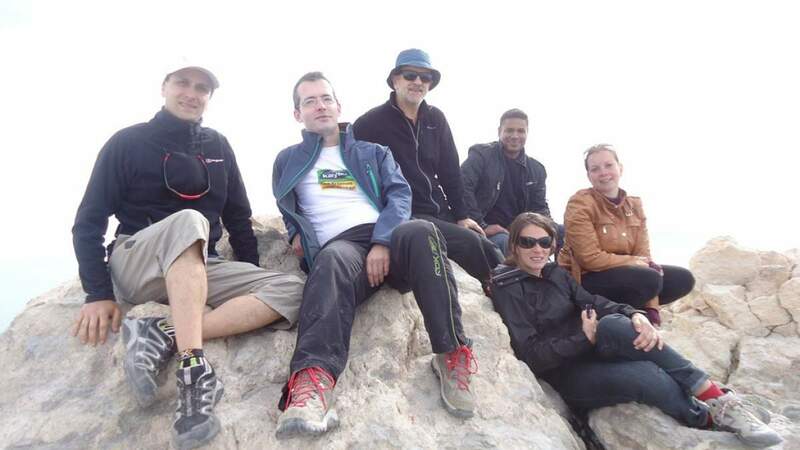 It took as around 6 hours and 15 minutes for ascent, and 3 and a half for the descent. With the time spent on the summit, this was a 10 hours and 45 minutes hard tour. 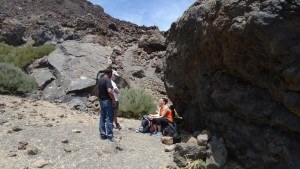 Many details about Teide are available on my another page within this site. 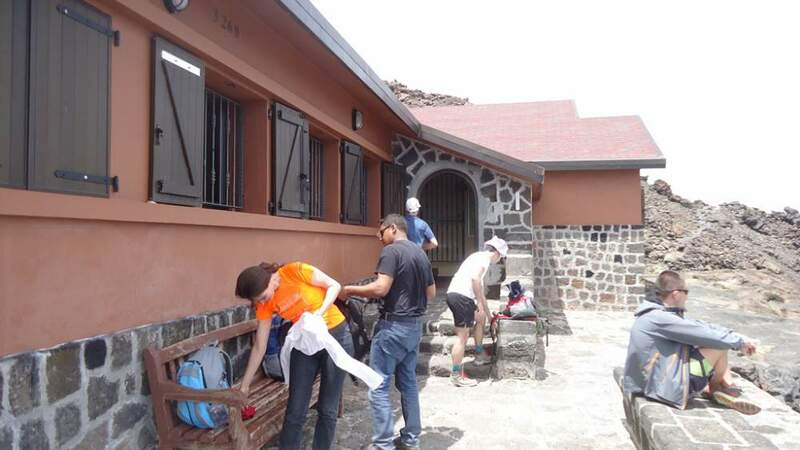 The present post is a more personal account, intended to share our impressions through the photos which you will see here, and with just a few details about the climb. We started at around 11:40 am, and we were on the summit a bit before 6 pm (this is in fact my time, I was not the first on the top). We had a few stops on the way up, one of them was at the Altavista hut where we partly emptied the contents of our rucksacks. 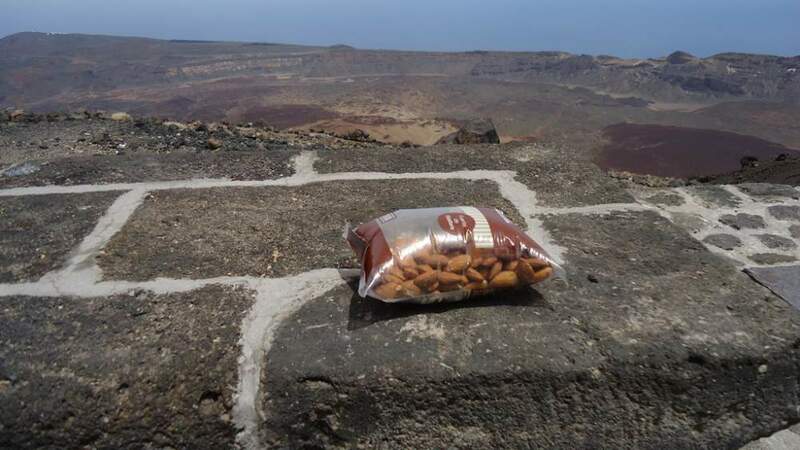 And indeed, after that rucksacks became less heavy, contrary to our stomachs, which was not the best situation in the hard Martian landscape which followed after the hut. So we were reasonably fast in reaching the summit (do not even dare to doubt it, we indeed managed, the first photo above proves it). But, I guess this was slow for Pedro. Do not know who Pedro is? OK, imagine an Alpine goat with two legs, and that is it. The first rest, before the steep part. 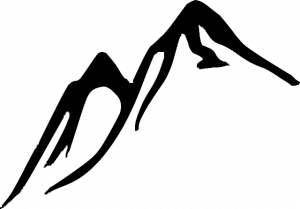 The second rest – Chloe in the shadow of lava balls. Some 45 minutes before the hut. Hard, but look what a reward. Time to check what we have in our backpacks. Some physics (boring I know, you may skip this) – the effects of the reduced external air pressure. No, this is not Elena on Mars – this is below Teide summit at around 3400 m above the sea. 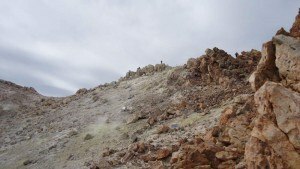 This does not smell good – sulfur field and steam below the summit. And what you see on the summit is the two-leg goat I mentioned earlier. Below the summit, on the way back. Happy faces. In front of the ice cave, Roderick just climbed back from it. Ask Angel for coordinates, he is the gadget guy. 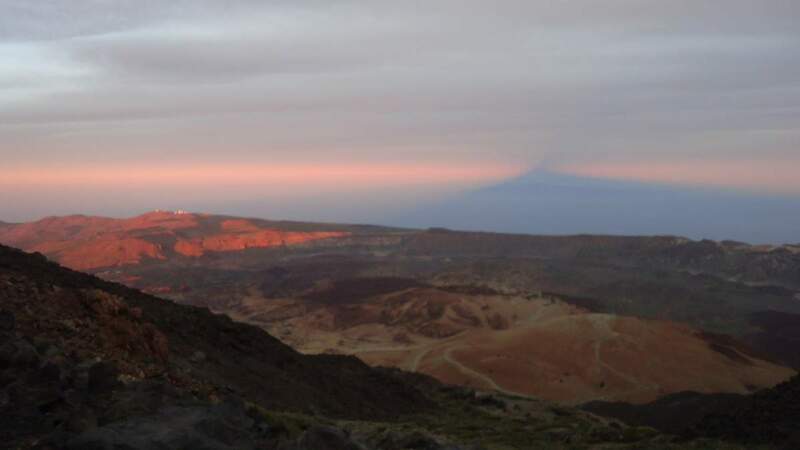 Shadow of Teide at the sunset, and Teide Observatory on the left. Some strange feature above the shadow is what we yet have to explain, well we are physicists after all. But some help in this sense would be welcome. On the way back, below the hut we used torches, but when we were on the lower part we enjoyed the full moon all the long way back to the parking. And it was a long one, take my word for it. We were back in Santa Cruz just after midnight. I hope you enjoyed the photos and music. If so, please leave some comments below, and share this text with others. I shall be happy to read them. 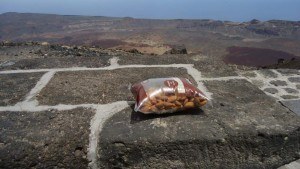 Your post has been helpful to me in many aspects because I am a mountain hiker and I plan a visit to Tenerife next week. Given that the permissions for next week are fully booked and I do not want to stay at Altavista, I would like to ask you more about the 7PM to 9AM ascents. How is it that the permission before 9AM is “granted” if I stay at Altavista when the permission is not even needed before 9AM? Is this just a tourist booklet trick to attract more people to stay at Altavista and spend money there or are the ascents during this time theoretically illegal, but practically unenforced because the rangers take the last cable car at 5PM? I need to know this, because I must instruct my family what to do when they are up there at 4PM – if they should rather stay away from the upper station so as not to make an impression of intending to ascend or if they can stay there without being a kind of “forced” by the rangers to take the last cable car down. If this was the case, it would not be good for them to stay in the upper station, but rather walk several hundred meters down towards the Altavista. We plan to ascend the top for the sunset. The piece of music you have included in the article is very beautiful. It was just in the right place. Think about earthshine, which can be seen from Earth when the Moon is new, or nearly so. The dark side of the Moon is shining by the light reflected from illuminated Earth in the lunar sky. Similarly here, the bottoms of the clouds are illuminated by the light of the setting Sun reflected by the ocean, whereas in the shadow area, this solar light is blocked and the cloud bottoms are therefore darker. 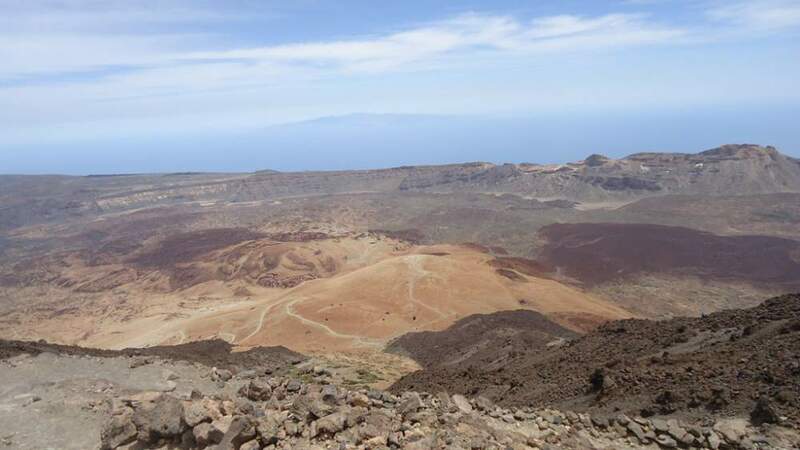 And because the northern slopes of Pico de Teide are steeper than the southern ones, the shadow is extended to the right side and therefore the feature also appears to flow to the right. Although the island itself is extended to the north, the summit area is in fact more gradual to the south and this is what has the crucial influence on the shape of the shadow. Please note that this is only my thought that can be wrong, but it seems to me quite reasonable. 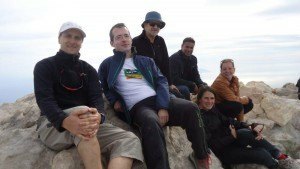 Hi Matúš, thank you for visiting the site, it is great to hear from a colleague. Yes this is about the thin air and normally people cannot make fast progress. So although you may be fast, your family would have to wait longer than you expect. 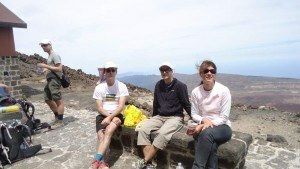 I climbed Teide 6 times and it was normal feeling regarding the altitude, hard but doable, but in my 6th climb I hardly managed. I do not know how I got to the summit, that is how bad I felt. This tells you how unpredictable it can be even with somebody who has been there many times and also climbed much higher mountains elsewhere. Your family indeed can walk toward Altavista and meet you there, but then if they want to go back to the summit this may be annoying and also hard for them. You could start 2-3 hours earlier and they could take the last gondola and then walk toward the Altavista without descending, there is a maintained walking path which goes partly around the summit in both directions from the lift station. You are right about permission before 9 am. There is simply nobody there to check and visitors at Altavista mostly want to be on the summit at sunrise, so there is no solution for this, rangers are not there. I wonder if you have seen the other text about climbing Teide in combination with Pico Viejo, this is an exceptionally nice tour. You family can wait for you at the end of the walking path because your own route would go there in any case. So they could walk clockwise around the summit and get to the end of the path in 20-30 minutes and wait you there. Then you can continue to the summit and descend to the other side, to Montagna Blanca. But this may be a bit risky for them, imagine you had to give up for any reason and they will be at 3500 meters with the night coming. It is cold there. Play safe whatever you do. I did some nonsense long ago with my family in the Alps, and when I think about it cannot forgive myself. I wanted to do some shortcut and we descended through uncharted area, and the night was coming. I was simply an idiot. You will need headlamps, think about this. Thank you for the explanation of the inverted shadow, now I am sure I am dealing with yet another physicist. I take my hat off to you, this looked like a lot of hard work. I bet it was worth it in the end though, the views look pretty epic. 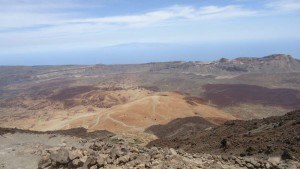 I have been to the Canary Islands before and the terrain looks pretty hard going and tough on your feet. Did you guys suffer from many blisters? How did the altitude affect you? Hi Dave, it was indeed worth it. 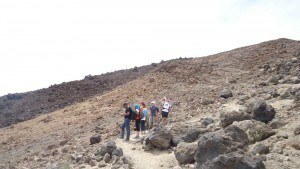 The terrain is in fact the hardest possible, volcanic in true sense. I myself have been using shoes which I broke in properly, so up to 10 hours walk is not a problem. Regarding the altitude, yes you feel it terribly when you come directly from the sea level. 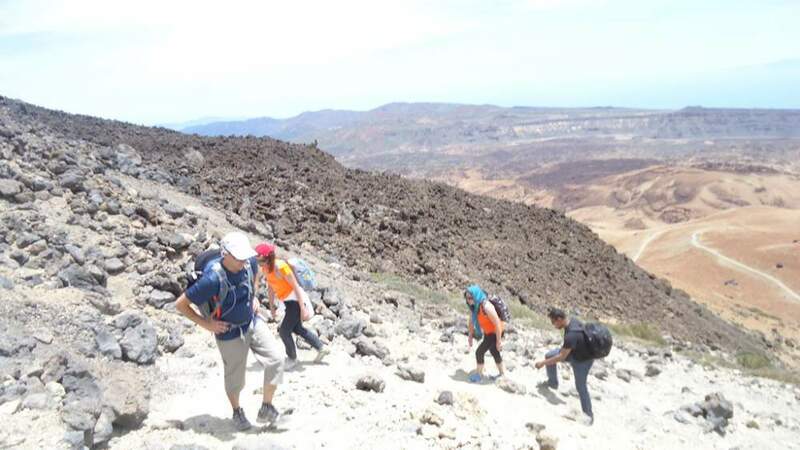 You cannot walk fast, it is around 65 percent of the sea-level oxygen only, so taking a rest after every a few steps is a good way of dealing with it. Thank you for visiting my post. Great website you have made. Such informative content you have. I really like how you’ve designed your site. It is easy to navigate. Also, the format of your site is nice and easy to read. I will be bookmarking your site to refer back to for future cases. Best wishes to you in your future endeavors. Hi Stephen, great to read your comment. I am happy that you like my site. Many thanks. Wow! loved your post. I love going on treks but am not fit enough. I remember on a certain trek I went to. The guide was walking way way ahead of me and I was somehow trying to catch up. Sometimes, the guide was sitting up there, waiting for me to catch up. Not only that, I had to sit there and rest for about 10 minutes even after I caught up with him. And what do you know, the guide didnt even break a sweat. Very fit these guys are. It was tough for me, but the view and the peace I felt on reaching the top was worth it. Hi Faraz, great to read your comment. If you ever join me I promise not to push too much. It is hard walking on high altitude. The air is thin, see how it changes with altitude here in my another post. 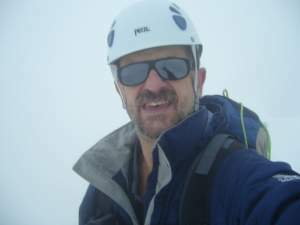 I have been looking into mountaineering and I think with all your experience you could recommend some great locations. After further looking into your website I am convinced you know what its all about and think your wisdom learned through experience would be of great assistance to me. Hi Benjamin, thank you for visiting my site. Let me know through email if I can be of any assistance to you. Take care. Hello, Jovo. Another great post. I really enjoy your photos and I like the music you added, nice touch. Great work! A bunch of physicists on the highest Spanish peak, that’s cool! 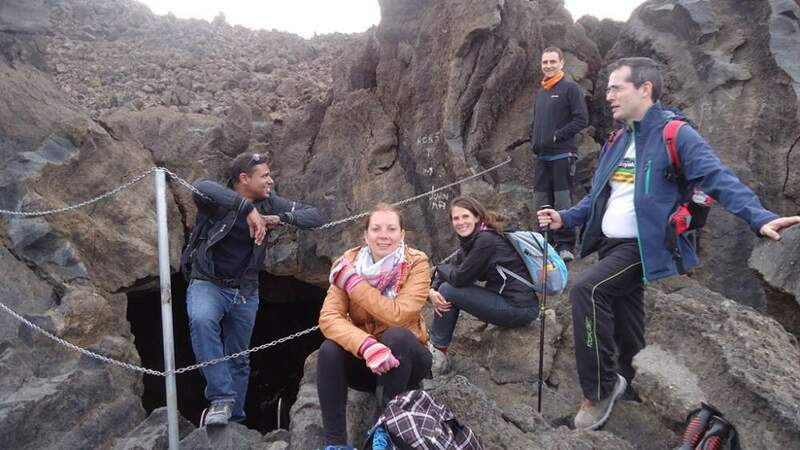 This shows that physicist or scientist don’t just simply sitting in a lab whole day long, can also be as adventuress and as active as anybody. 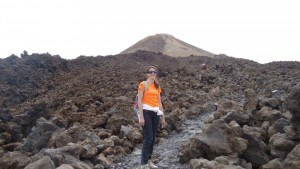 Teide at Tenerife looks like a great place to climb indeed.